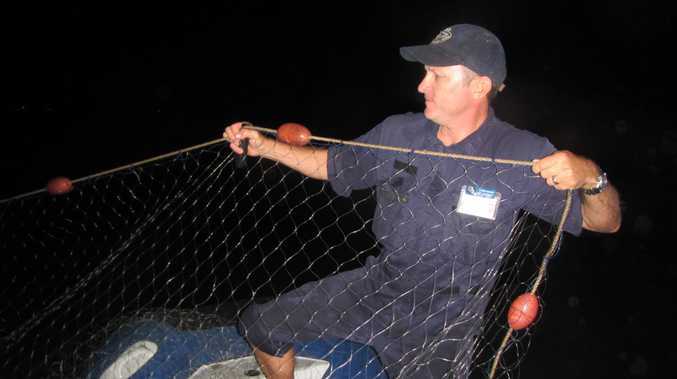 Queensland Boating and Fisheries Patrol officer Neil Conway recovering the net that was illegally used by two recreational fishermen in a Dugong Protection Area. TWO recreational fishermen were fined $1178 each for using illegal nets in a Dugong Protection Area in Gladstone. Queensland Boating and Fisheries Patrol officers recovered the two nets set on the foreshore of Facing Island. CQUniversity marine ecology lecturer Emma Jackson said it was important we protected the small population of dugongs we do have in the Gladstone region. She said more publicity was needed around where the protection areas were. The use of commercial fishing nets is one of the pressures facing the population, additionally to seagrass and being struck by boats. A map of the dugong protection area in the Gladstone Harbour. Ms Jackson said being able to protect them from one harm, illegal fishing, would help protect the species. The nets were seized and will be forfeited to the Crown. "Some people think that our population of dugongs aren't very important since it is quite small, but that means it's even more important that we don't lose any of them," Ms Jackson said. "We have a 0 loss rate that we need to maintain. "There are other areas like Shoalwater Bay that have quite large populations and they can afford to lose 5% without it having too much of an impact on the overall population." 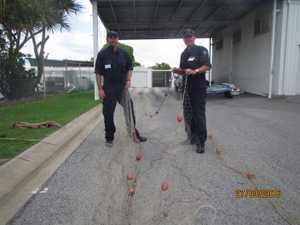 Queensland Boating and Fisheries Patrol officers Ashley Meekings and Neil Conway measuring the net that recreational fishermen were caught using in a dugong protection area. In 2009 there was 20 recorded dugongs in the Gladstone region. The Gladstone Ports Corporation and CQUniversity is currently working to record the population numbers again. "The fact that they are here is quite rare and unique."